I will be joining Sean Herriott at 7 AM Eastern on Relevant Radio. We will discuss Monday’s feast of the Triumph of the Cross. 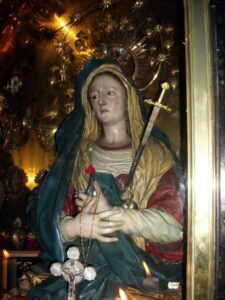 We will also discuss today’s Feast of our Lady of Sorrows since she was at the foot of the Cross. On Monday I was fortunate enough to join Fr. Groeschel in his private chapel in Larchmont NY at the Trinity Retreat Center for the Feast of the Triumph of the Cross — with six priests in a tiny little chapel in his house. I would have liked to have a better picture, but it just seemed inappropriate to pull out my iPhone during the very solemn and holy Mass. I am providing a link to a few of my articles on the Cross to celebrate this feast day– and to provide more info for those who listened to the show. 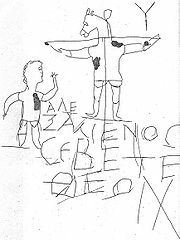 -Earliest surviving depiction of the Crucifixion is the Alexamenos graffito from a wall near the Palatine Hill in Rome 1st-3rd century. It was made to mock and ridicule Christians. The cross was not a sign of glory in the first years because it was still used as a gruesome form of execution. For more see the Wikipedia article here. G.K. Chesterton is timeless so why can’t he speak from the grave about such as fool as Dan Brown (DaVinci Code and Angels and Demons)? I am glad Obama is against killing pro-life activists . . .
. . . but it sure seems inconsistent to me that he can point to one group with words of non-violence while pointing to the pro-abortion groups in supporting a medical procedure that pulls a baby’s head out of his/her mother’s womb . . .
. . . before piercing the baby’s skull with a blunt object and then sucking his/her brains out with a vacuum . . . 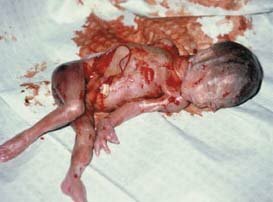 This is called Partial Birth Abortion and this president promotes the practice. 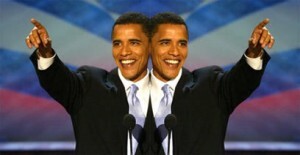 Nice try at peace and anti-violence Mr. President! Everyone enjoying all this new HOPE and CHANGE? Our webmaster and computer genius Adam Henriksen is working at our house this week to upgrade and completely revise my websites, blog and stores. I think you will like the design and functuality. I am quite excited.